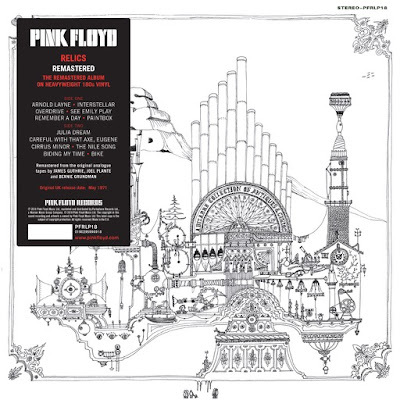 Pink Floyd are continuing their vinyl reissue series with the upcoming May 18 release of their 1971 compilation, “Relics”, on heavyweight 180-gram vinyl. The set was Pink Floyd’s first album to include their first two singles – 1967’s "Arnold Layne" and "See Emily Play" – as well as the original studio recording of "Careful With That Axe, Eugene", the B-side of the 1968 single, “Point Me At The Sky", and rounded out with the then-previously unreleased 1969 Roger Waters track, "Biding My Time." Keeping true to the original artwork, the 2018 “relics” reissue features the black and white drawings by drummer Nick Mason, carrying the iconic subtitle ‘A Bizarre Collection of Antiques & Curios’. Remastered by James Guthrie, Joel Plante and Bernie Grundman, all tracks are the original stereo versions except the Syd Barrett-era, mono mixed singles "Arnold Layne" and "See Emily Play." Upon its original release, “Relics” reached No. 32 on the UK charts and No. 152 on the US Billboard 200. The “Relics” reissue arrives on the same day as Pink Floyd deliver their 1995 live package, “Pulse”, for the first time in many years on heavyweight 180-gram vinyl. The 4LP set captures the UK outfit in concert on a 1994 European tour in support of “The Division Bell” and delivers their 1973 album classic, “The Dark Side Of The Moon”, in its entirety for the first time in almost two decades.